The real-life inspiration for Guardians of the Galaxy hero Rocket Raccoon has died. The raccoon named Oreo — whom animators used a reference point for the Marvel Cinematic Universe character — passed away yesterday (February 7) following a short illness, his family confirmed in a Facebook post. He was 10 years old. 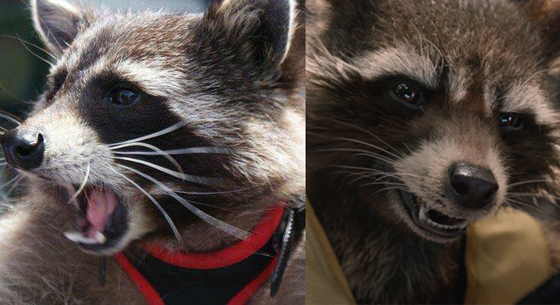 Marvel had used the racoon as a model for accurate movement and colouring of its on-screen character. In the film franchise, Rocket is voiced by Bradley Cooper, with motion-capture work done by Sean Gunn. In their Facebook post, the family thanked "our wonderful vets for their compassion and care," adding that their furry friend "made so many people's lives happy" and has "been an amazing ambassador for raccoons everywhere." "You loved all people of all ages and other animals too and were never phased by anything be it a walk down the red carpet as Rocket Raccoon, a trip to a hospice to visit a sick child or anything else that came your way," the statement read. "You just enjoyed everything and it showed." You can read the family's statement below. Yesterday, it was also revealed that the forthcoming third film in the Guardians franchise will use the script of ex-director James Gunn.